Please follow the directions for use and dosage instructions printed on your OsmoLax Relief pack. Your OsmoLax Relief pack contains pre-measured sachets or a measuring scoop, either a double-sided 8.5g/17g scoop, or a single 8.5g scoop, depending on the product purchased. One sachet or one level 17g measuring scoop mixed with 1 cup (approx. 240mL) of liquid once daily. This can be increased to a maximum of 2 doses of 17g daily, dependent on the severity of your constipation and need. The usual starting dose is two level 8.5g measuring scoops (or one 17g scoop), mixed with 1 cup (approx. 240mL) of liquid once daily. The dose should be adjusted up or down as required to produce regular, soft, comfortable stools. The maximum dose should not exceed three 8.5g scoops daily. The usual starting dose is one level 8.5g measuring scoop, mixed with ½ cup (approx. 120mL) of liquid once daily. This can be increased to a maximum of two 8.5g scoops (or one 17g scoop) mixed with 1 cup (approx. 240mL) of liquid daily, if required to produce regular, soft, comfortable stools. Add OsmoLax Relief to your favourite drink of choice, such as water, juice, soft drink, tea or coffee, according to the dosage instructions on your pack. Stir until dissolved then drink. 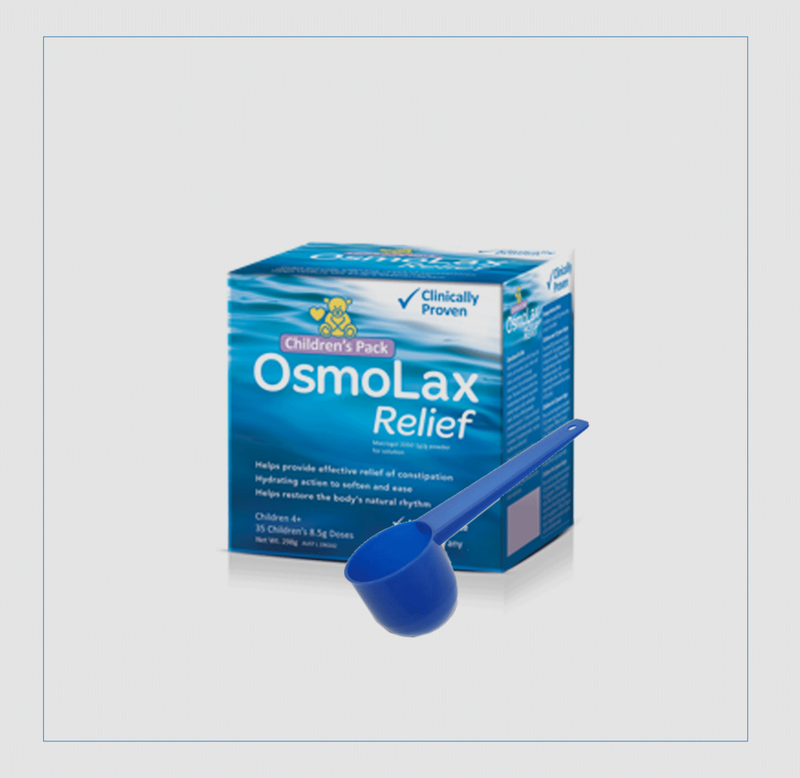 OsmoLax Relief generally produces results in 1-3 days. Continue to take until your body’s natural rhythm is restored. The dose of OsmoLax Relief can be adjusted up or down, as required to produce regular, comfortable stools. If symptoms persist, see your healthcare professional. OsmoLax Relief can be mixed and stored in the fridge up to 6 hours before taking. Discard any solution that is not used within 6 hours. OsmoLax Relief should be taken 2 hours before or after other medication.